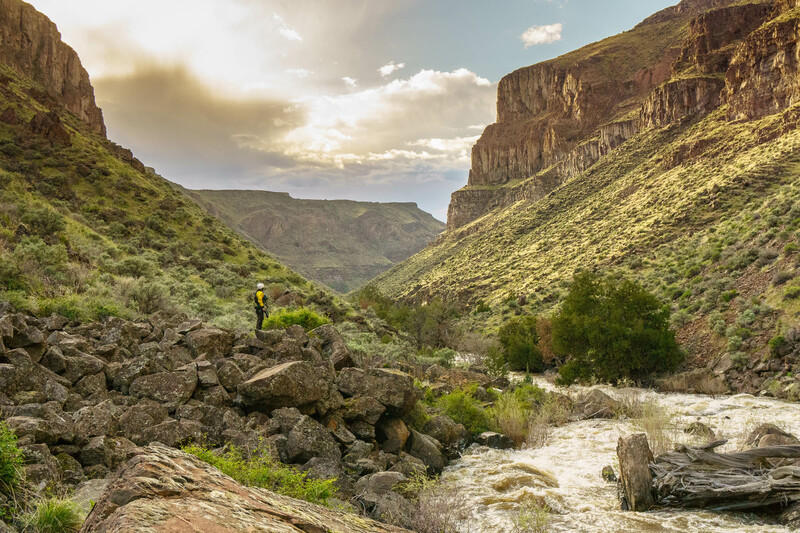 The Jarbidge – Bruneau — and the whole Bruneau River system — was very popular with expedition boaters back in the day (just ask Ed Geiger, the local shuttle driver), but has become a bit less well-known outside the greater Idaho area in recent years with no good reason. 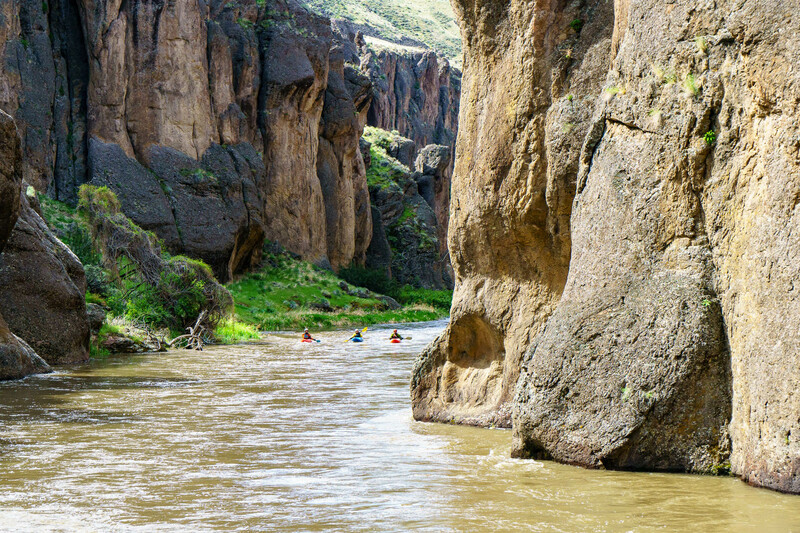 It’s a classic remote desert trip complete with good whitewater, stunningly beautiful rhyolite canyons, and hot springs, and it tends to go off at the beginning of the western whitewater season. Not sure you can ask for much more! The 40 miles of the Bruneau go pretty quick when you’re floating through canyons like this for most of it. Permits are self-serve at the put-in with no limits on use. You’re very unlikely to see a BLM ranger in this area, but there are Jarbidge-Bruneau river rangers and their limited requirements are very reasonable. Groovers must be rigid and watertight and firepans must be metal and elevated off the ground (though contrary to the Grand, you’re allowed to just elevate with rocks at camp). The put-in is just short of the Nevada border past a small town called Murphy Hot Springs. According to our shuttle driver, the big news item of 2016 in Murphy Hot Springs was that a group of “rock chucks” (woodchucks living in a rock pile) had moved to a wood pile and become woodchucks. It’s way out there, and the only thing you pass on the way to the put-in is an Air Force bombing range. Google recommends driving 180 miles around through Twin Falls — don’t do that. The dirt road option is usually pretty good, just remote. If it’s been raining it can be quite muddy. Paying for shuttle on this run is a standard choice. There are a few of options, but if Ed Geiger is available, he lives in Bruneau and has been running shuttles in this area for many decades. He’s full of incredible stories about Rob Lesser, Jon Turk, and many other living legends and loves to talk — be ready for a very entertaining ride to the put-in and a reliable drop-off of your vehicle and a few beers at the takeout. These guys will apparently take you in their own vehicle which can save wear-and-tear and hassle. Daphnee Tuzlak scouting where to launch after portaging the main part of Jarbidge Falls. Even at higher flows, the majority of the whitewater on the Jarbidge is fast-moving class III, with one IV and two large Vs. That said, it’s a narrow river (and canyon) and collects a lot of wood. At most flows, you’d want a group with class IV skills to be safe in the face of unknown conditions. The first portage is a landslide rapid; historically, it’s been portaged on a grassy slope above the bank that collapsed. Personally, I found it safer and easier to portage over the boulders on the right bank. The second portage, “Jarbidge Falls,” is shortly before the confluence that forms the Bruneau River. At higher flows it starts from a small eddy on river left immediately below the start of the rapid — if you have any concerns you can get out earlier. There is an easy trail at river level. The Bruneau itself is mostly incredibly scenic flatwater, but there is a section of continuous III+ at low water and big-water class IV at high water called “Five Mile Rapids.” It’s not quite five miles long, but it’s long enough that a swim at higher flows can be dangerous. Camping is plentiful on the Jarbidge but fairly limited (by poison ivy, mostly) once you hit the Bruneau. 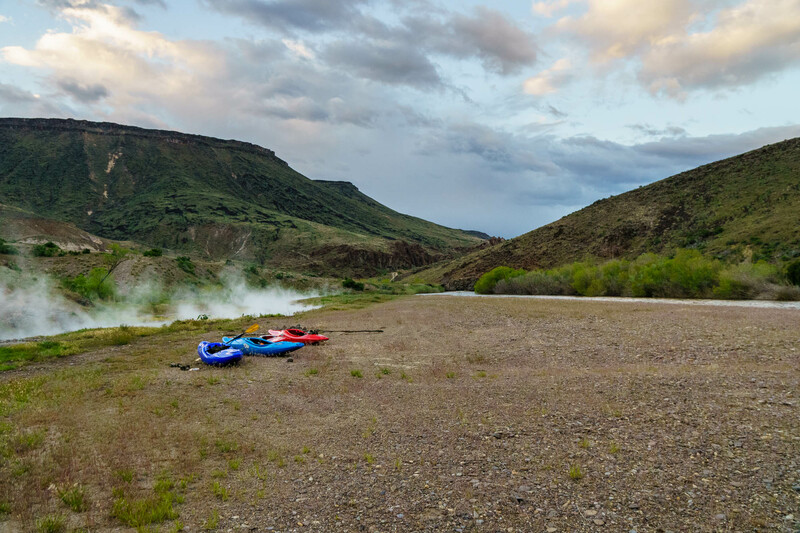 There are good camps at a number of the Bruneau’s confluences — the East Fork Bruneau and Sheep Creek are popular ones. You can also camp at Indian Hot Springs (the put-in for just doing the Bruneau). Stunning canyon scenery on the Bruneau. The Bruneau / Owyhee / Jarbidge area is apparently the highest concentration of rhyolite / basalt canyons in the western US. Most information available uses the Bruneau near Hot Springs, ID gauge (close to the takeout). 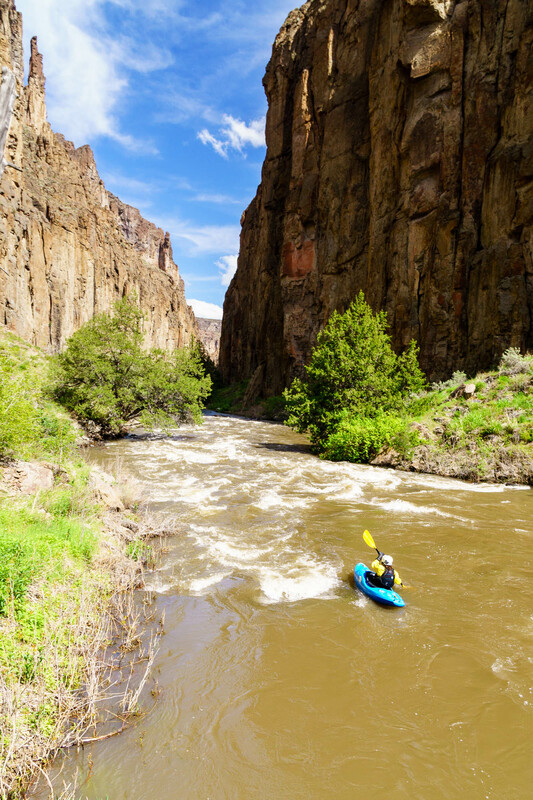 Hardshell kayak trips are recommended above 700cfs on that gauge, but packrafters have floated the West Fork of the Bruneau as low as 300cfs on that gauge. At flows approaching 3000cfs, the Jarbidge is mostly continuous III-IV and Five Mile Rapids on the Bruneau is solid, pushy IV. Other forks and tributaries of the Bruneau provide excellent multi-day adventures (up through class V) and similarly stunning scenery. With the right flows, you could spend two weeks in this area doing every one — though it can be hard to line it up. If flows are low, it’s also possible to do just the Bruneau, but the access road to Indian Hot Springs is reportedly very bad. Landing at Indian Hot Springs after a long day running shuttle and paddling the entire Jarbidge. The Bruneau in particular is littered with poison ivy. A swim in Five Mile Rapids likely means wading through a sea of poison ivy to get back to your boat. Be warned! Rattlesnakes are also common in this area.